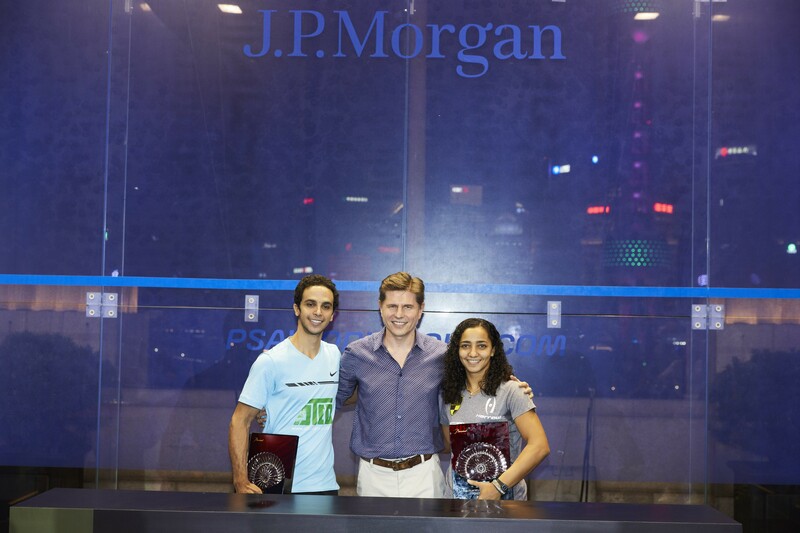 Egyptian duo Raneem El Welily and Mohamed Abouelghar are the 2018 J.P. Morgan China Squash Open champions after they defeated France’s Camille Serme and New Zealand’s Paul Coll, respectively, on finals day at the Peninsula Shanghai, which overlooks the famous Shanghai Bund. 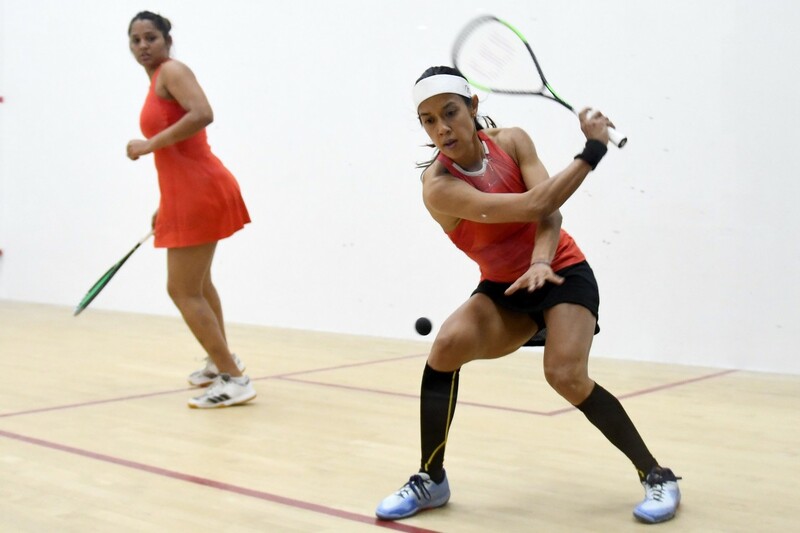 El Welily captured a second China Open crown after the current World Champion defeated World No.5 Camille Serme by an 11-5, 8-11, 11-6, 11-5 scoreline to extend her run of straight wins over the French player to five matches. 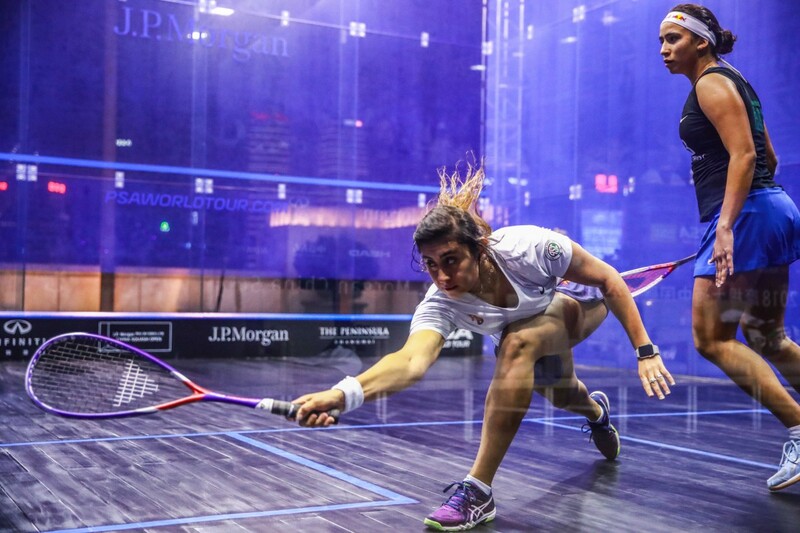 The opening two games saw both players play some high quality squash until, with the scores level, El Welily showcased her supreme shot-making skills to claim the 18th PSA Tour title of her career. 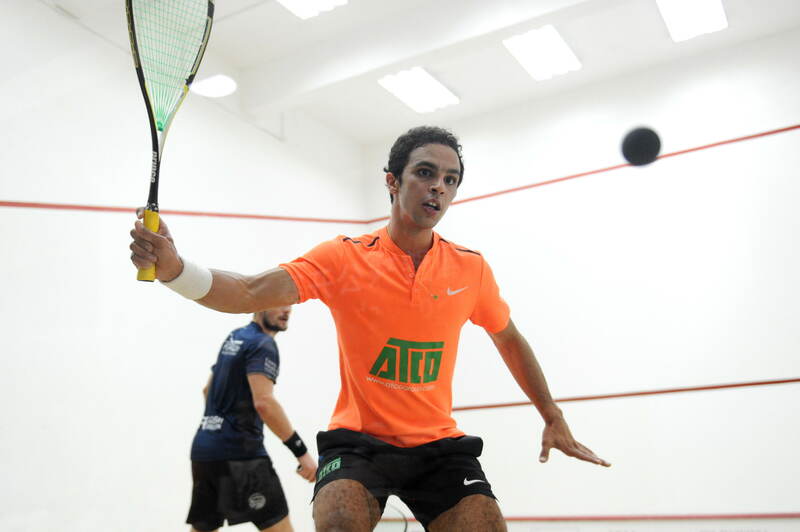 "I am very happy to be back here and to win it again for the second time," said El Welily. "I’m just happy to start the season with a win. The final is never easy, I don’t think I played my best squash today but mentally I was maybe better than in other matches. 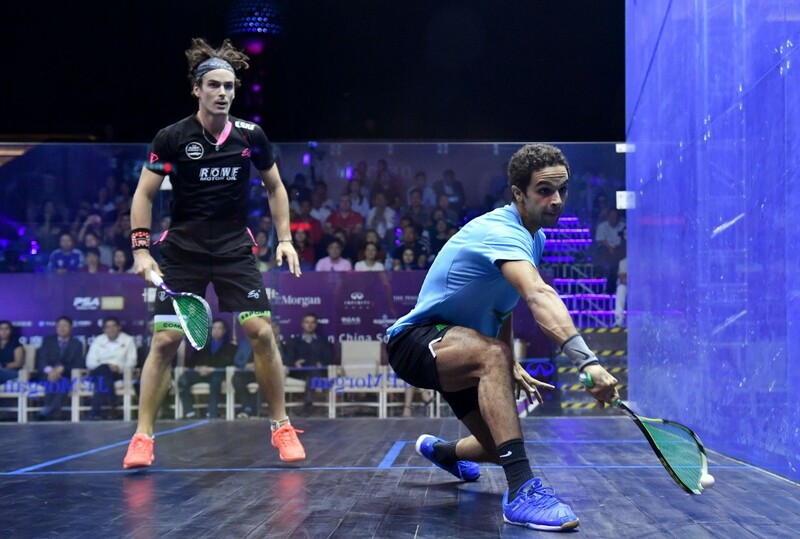 Meanwhile, Abouelghar capped a superb tournament by lifting the biggest PSA Tour title of his career after a scintillating display saw him absorb Coll’s physical blows brilliantly before striking with some sumptuous winners at the front of the court. Coll’s best period of the match came in the third game when he built up an 8-6 lead but Abouelghar stayed focused mentally to come back and win the next five points in a row, sealing the win by an 11-8, 11-8, 11-8 margin to claim a ninth PSA Tour title. "It’s the biggest title for me so far and maybe it's my lucky place, so I want to thank everyone involved," said Abouelghar. "I expected before the match that it was going to be hard work, and if I wanted to have any chance against Paul I had to be patient and not go for shots as often as I would like. I think when I was sharp when I went short and I’m happy that it paid off. "Not many people get the chance to travel all over the world doing the thing they love so I’m just happy to be one of these people. I’ll just enjoy every minute and the results will take care of themselves." El Welily and Abouelghar are the first players to win a PSA World Tour Gold tournament after the tier was introduced as part of the new PSA tour structure, which came into effect on August 1. 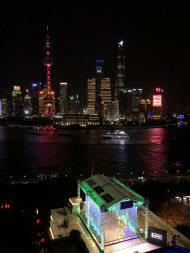 France’s Camille Serme and New Zealand’s Paul Coll sent top seeds Nour El Sherbini and Simon Rösner to semi-final exits at the J.P. Morgan China Squash Open after both players prevailed in five-game battles at the glass court atop the Peninsula Shanghai, which overlooks Shanghai’s iconic Bund. Serme, the women’s World No.5, ended a four-match losing streak against World No.1 and defending champion El Sherbini after finally converting the third of her match balls in the deciding fifth game after El Sherbini had come back from two games down to level the scores. "I think I managed to find the right tactics from the start and I guess she was a bit nervous to be 2-0 down,” said Serme, speaking after her 11-9, 11-8, 9-11, 8-11, 13-11 victory. “But she’s the World No.1 and she’s such a fighter, I knew it wasn’t going to be easy. Even though I was way up in the third and fourth she came back really strongly and I think I was just right with my tactics and kept pushing. The China Open is the first PSA World Tour Gold event to take place since the new PSA tour structure came into effect on August 1, and Serme will take on reigning World Champion Raneem El Welily in the final as both players bid to become the first woman to lift a title at this tournament tier. El Welily won the China Open in 2015 and she will compete for the chance to double her tally after an 11-4, 7-11, 11-8, 11-8 triumph over fellow Egyptian and World No.3 Nour El Tayeb. “I’m really happy with my win today over Nour, it’s never easy, she’s very persistent and her retrievals are very good,” said El Welily. 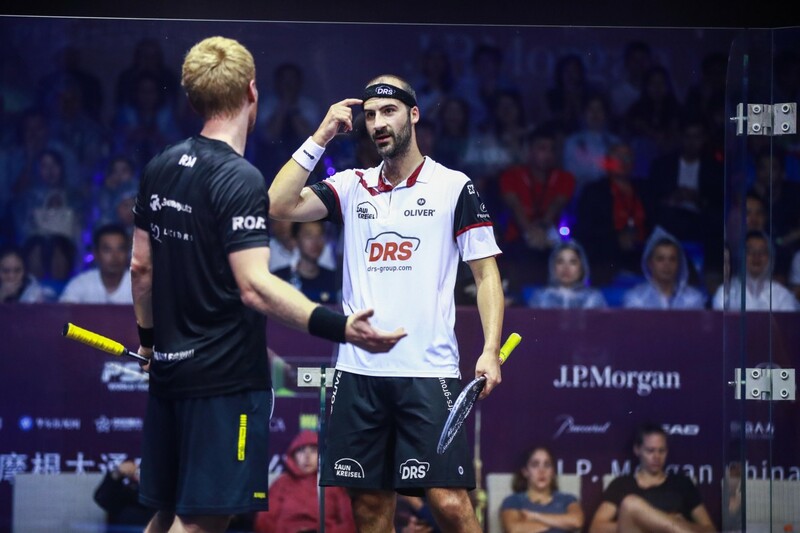 Meanwhile, Coll ended World No.5 Rösner’s tournament after a brutal 90-minute epic and the Kiwi World No.10 will appear in his biggest PSA Tour final since he lifted the Channel VAS Championships trophy back in December 2016. Rösner was on the verge of earning a final berth after going 2-1 up and 9-6 ahead in game four but Coll showed nerves of steel to come back into the encounter and level the scores, before edging a tight decider to record an 8-11, 11-6, 7-11, 11-9, 11-7 triumph. “That was a real classic battle out there with Rösner,” said Coll. 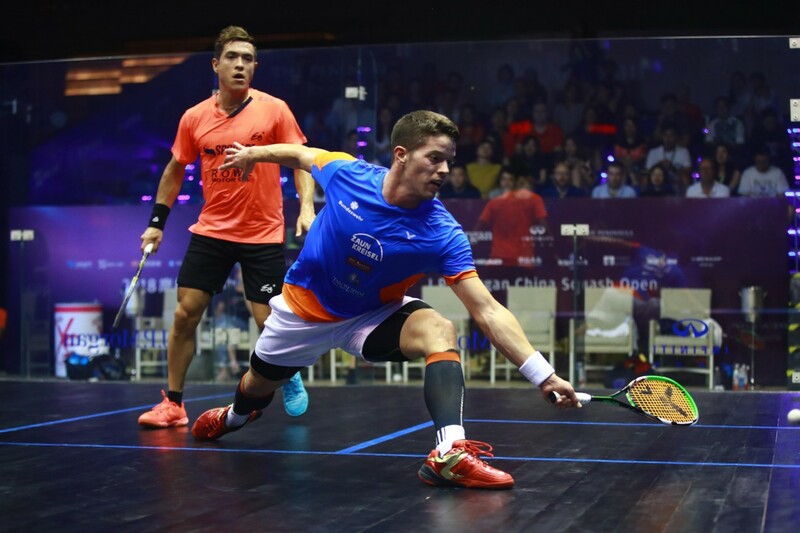 Coll will line up against Egypt’s Mohamed Abouelghar in the title decider after the World No.13 followed up a shock quarter-final win over 2015 champion Gregory Gaultier with a 3-2 defeat of Indian No.1 Saurav Ghosal. 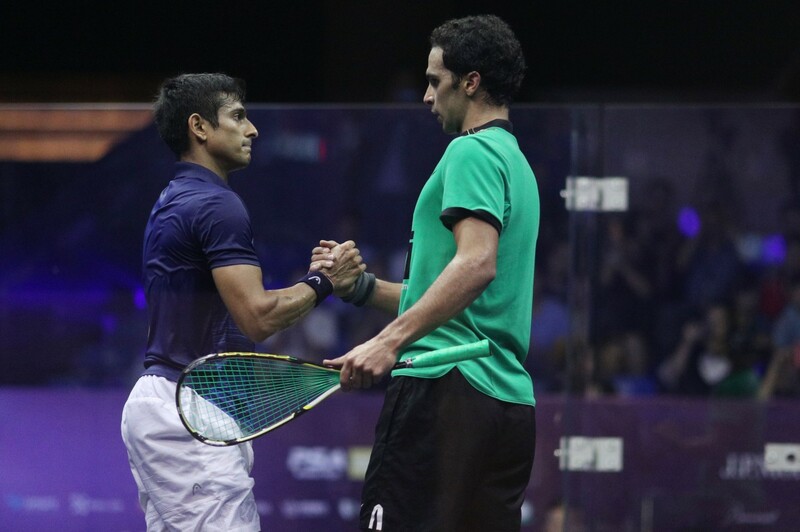 "To play here in the semis in this amazing venue is unbelievable for me," said Abouelghar. "I’ve been working hard this summer and to see my work paying off is a great way to start the season and hopefully things go my way tomorrow." The finals of the China Open will begin at 19:00 local time (GMT+8) on Sunday September 9 at the Peninsula Shanghai. 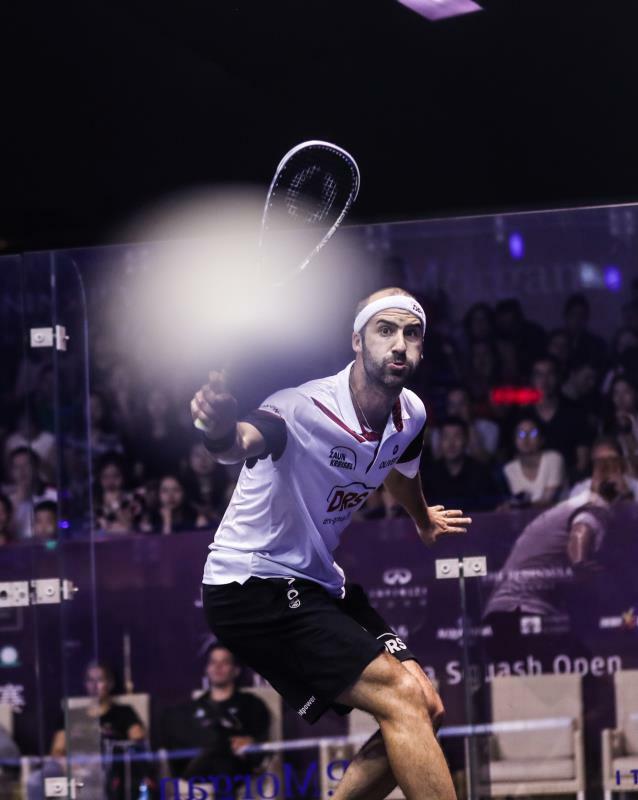 Egyptian World No.13 Mohamed Abouelghar will appear in the biggest PSA Tour semi-final of his career after he caused a huge upset against number three seed Gregory Gaultier in the quarter-finals of the J.P. Morgan China Squash Open taking place in Shanghai. 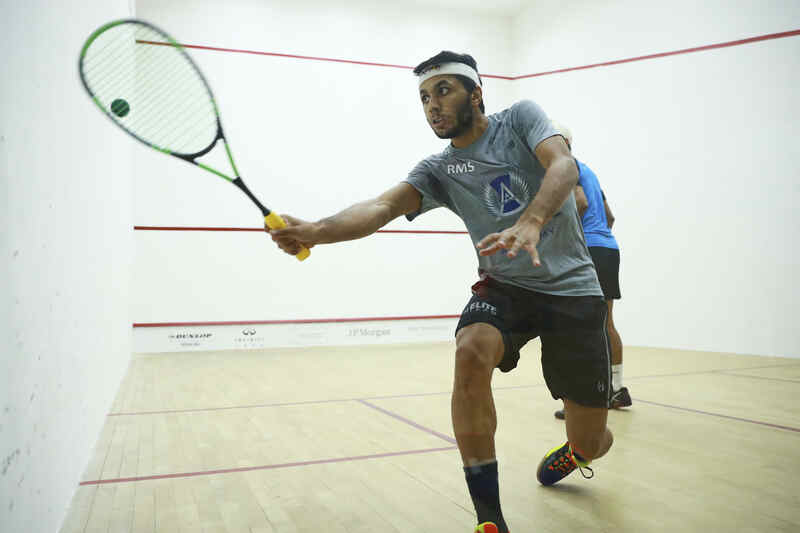 The tournament is the first PSA World Tour Gold event ever to take place under the new PSA tour structure - which came into effect on August 1 - and Abouelghar ensured that he will stay in the hunt for the title after a 12-10, 7-11, 11-4, 6-11, 11-8 victory sent Gaultier - the 2015 China Open champion and former World No.1 - to a shock defeat at SECA Academy. "I’m very pleased to beat Greg for the first time," said Abouelghar, who had lost to the Frenchman in all four of their previous meetings. "I’ve been watching him growing up and of course I've learned a lot from him. I'm very happy with how I held it together until the end and turned it around my way this time. I'm looking forward to playing at one of the sickest venues in our sport." Abouelghar will line up against India’s Saurav Ghosal for a place in the title decider after the World No.12 got the better of Germany’s Raphael Kandra, coming from a game down to win it 7-11, 11-6, 11-5, 11-7. Top seed Simon Rösner and New Zealand’s World No.10 Paul Coll will go head-to-head in the other men’s semi-final after they claimed respective victories over Welshman Joel Makin and Qatar’s Abdulla Mohd Al Tamimi. A period of light rainfall in the build up to Rösner and Makin’s match at the glass court erected on top of the Peninsula Shanghai - which is an open air court overlooking Shanghai’s spectacular Bund - meant that the pair had to cope with some difficult court conditions and, speaking after his 11-5, 11-7, 8-11, 11-6 triumph, Rösner says that his wealth of experience helped him to emerge victorious. “It was quite difficult because in the middle of the fourth game rain came into the court, just some small drops but it made it more slippery,” said Rösner. “We were a bit unlucky with the rain, I think. It didn’t make it easy but I am happy to keep my head straight even after I lost the third game. The rain also played its part in the day’s following match - which pitted Egypt’s World Champion Raneem El Welily up against 2013 winner Nicol David - and it was the player from Malaysia who initially adapted to the conditions the better of the two as she fought back from a game down to go 2-1 ahead. But a fired up El Welily came back on court a different player in the fourth and the momentum shifted back in her favour as she claimed wins in the final two games to earn a semi-final spot against World No.3 Nour El Tayeb, who defeated England’s Sarah-Jane Perry 3-2. “Nicol was playing very, very good squash today, all credit to her, the way she played was just amazing,” El Welily said. World No.1 Nour El Sherbini will take on French World No.5 Camille Serme in the other women’s semi-final. 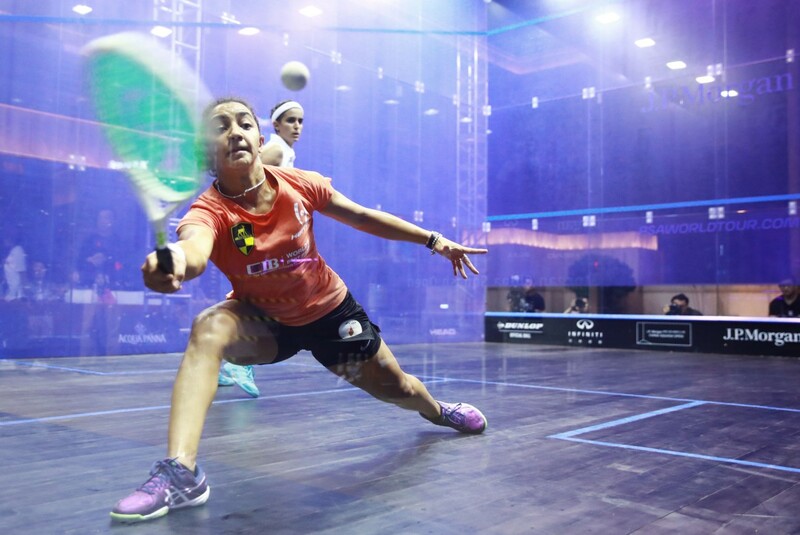 El Sherbini, the defending champion, claimed a ninth successive victory over fellow Egyptian Nouran Gohar in a repeat of last year’s final, while Serme overcame India’s Joshna Chinappa in straight games. “I’m really happy and I feel that I’m getting my momentum back and the rhythm of the game,” said El Sherbini. The China Open reaches the semi-finals stage tomorrow (Saturday September 8) with all matches taking place on the glass court at the Peninsula Shanghai. Matches begin at 18:30 local time (GMT+8). World No.22 Raphael Kandra sent number two seed Miguel Angel Rodriguez crashing out of the J.P. Morgan China Squash Open, PSA World Tour Gold event after a sublime display from the German saw him claim a victory in straight games atop the Peninsula Shanghai overlooking the spectacular Shanghai Bund. Kandra ended the 2017/18 season on a high with a breathtaking run to the semi-finals of the British Open, with eventual title winner Rodriguez - who last week won gold at the PanAmerican Squash Championships - getting the better of the 27-year-old in Hull. But Kandra avenged that defeat with a controlled and peerless performance that saw him test Rodriguez in the front corners in particular, with the World No.6 lacking his usual dynamism around court as he slumped to an 12-10, 11-7, 11-7 defeat. “I was really motivated, I’ve lost to him the last two times in the British Open so I really wanted revenge today,” said Kandra. “I felt quite comfortable on the court today, I don’t think he was too comfortable moving towards the front and I made use of it. I tried to put balls away at the front, stay away from his retrieving abilities and it worked out in the end. Kandra will take on India’s Saurav Ghosal for a place in the semi-finals after he defeated Scotland’s Greg Lobban on a day that also saw top seed Simon Rösner (left) begin his tournament with victory over Malaysia’s Nafiizwan Adnan. 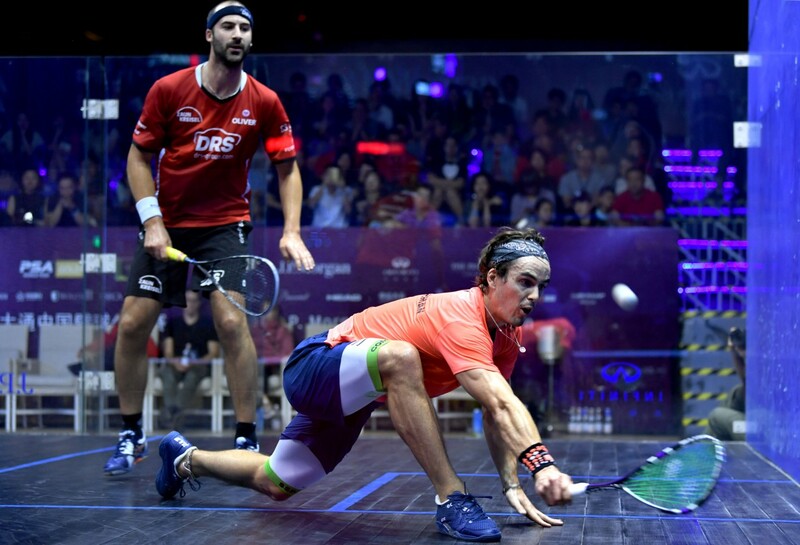 The German laid down a marker for the rest of the tournament as he put in a powerful performance despite the humidity and he gave Adnan little time to settle on the ball as the title favourite closed out an 11-5, 11-9, 11-5 triumph in 45 minutes. “I’m feeling good but missing a bit of match practice and competition,” said Rösner. Up next for the World No.5 is Welshman Joel Makin - who upset former World No.3 Omar Mosaad - while 2015 winner Gregory Gaultier dispatched Adrian Waller to ensure that he will face Mohamed Abouelghar next. World No.10 Paul Coll was also in action as he downed Scotland’s Alan Clyne and his reward is a quarter-final matchup with Qatar’s Abdulla Mohd Al Tamimi, who defeated Swiss number eight seed Nicolas Mueller. 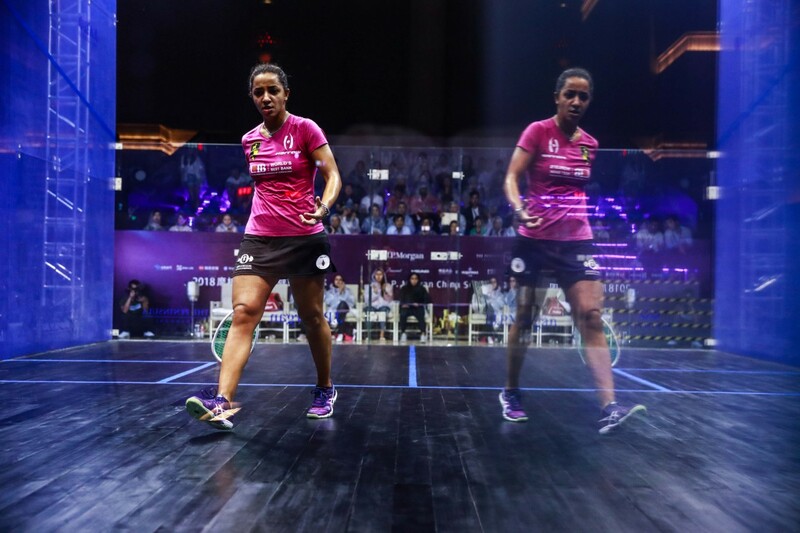 The women’s quarter-finals will be lit up by the prospect of reigning World Champion Raneem El Welily taking on eight-time World Champion Nicol David after they achieved wins over wildcard Li Donjin and 2015 winner Laura Massaro, respectively. El Welily didn’t quite hit her stride in the early parts of her encounter, with Li – who upset former World No.4 Omneya Abdel Kawy in the previous round – holding game balls on four separate occasions as she threatened to take an unlikely lead. The Egyptian held her nerve to come back to win the opener 15-13 though and she sailed to 11-6 victories in each of the next two games to earn her place in the last eight. “The first match of the season is always tough mentally, you’re still trying to work things out and see how you feel on court,” said El Welily. “I always expect the unexpected from Nicol, she’s so good and she definitely played really well to beat Laura today. I’m excited to see how she’s playing and to see how I can play against her." David rolled back the years at SECA Academy as she put in a superb display reminiscent of the ones she enjoyed during her nine years at the summit of the World Rankings. The 35-year-old– who saw her unprecedented reign at World No.1 ended by El Welily in September 2015 – had lost to Massaro on four of their previous five meetings but she got the better of the English player this time around, winning 11-6, 11-6, 11-7 to earn her place in the quarter-finals. “I had a good run throughout the match today against Laura and was very pleased with my performance to win 3-0,” said 2013 China Open champion David. Elsewhere, defending champion Nour El Sherbini overcame Wales’ Tesni Evans to set up a repeat of last year’s final with World No.6 Nouran Gohar - who fought back from two games down to beat World No.15 Salma Hany - while there were also wins for Camille Serme, Nour El Tayeb, Sarah-Jane Perry and Joshna Chinappa. The quarter-finals of the China Open continue on Friday September 7 from 15:00 local time (GMT+8) at SECA Academy and 18:30 at the Peninsula Shangai. World No.88 Li has appeared at the China Open since its inception in 2008 and had made it to the second round of the tournament only once, in 2010, over the past decade. Kawy, meanwhile, was ranked in the top 10 as recently as March 2017 but has appeared at just three tournaments over the past 18 months due to the birth of her son. And the current World No.86 was powerless to stop Li from racking up a 3-0 victory in 26 minutes, with tie-break wins in the first and third games sandwiching a comfortable 11-7 triumph in the second. Li’s second round match will come against reigning World Champion and 2015 winner Raneem El Weily, with the pair set to face off at the glass court atop the Peninsula Shanghai, which overlooks Shanghai’s famous Bund. "I have shown my best in the match, I just showed everything I have been trained before," said Li. "I’m happy to win the game, I’m glad to be here again. Thanks to the support of SECA and the Multi-Ball Games Administrative Centre of General Administration of Sport of China for holding this event. I really treasure being giving the chance to compete with these high level players." 2013 champion Nicol David was also in action today as she got the better of India’s Dipika Pallikal Karthik by an 11-3, 14-12, 11-9 margin to claim a seventh successive win against the World No.19. David - an eight-time World Champion - will contest a mouthwatering second round match with England’s World No.7 Laura Massaro in what will be their 32nd meeting on the PSA Tour, with David currently boasting a 22-9 lead on their head-to-head record. "I’m always happy to have a 3-0 win in the first round and against Dipika too," said David. "I was pleased with my performance and I’m adjusting to every moment with each game. I’m looking forward to my match tomorrow with Laura." 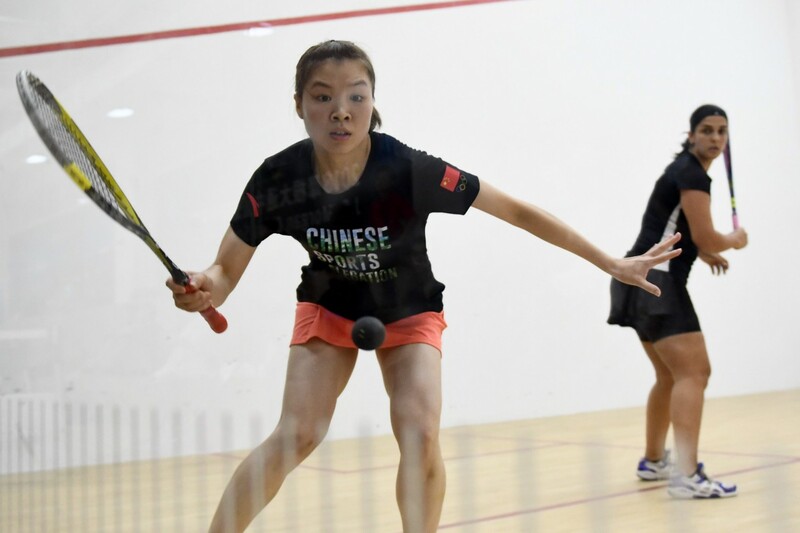 The other Asian interest in the opening day’s women’s fixtures came in the form of Hong Kong’s Joey Chan, who beat United States No.1 Olivia Blatchford, and India’s Joshna Chinappa, who got the better of Australia’s Donna Lobban. In the men’s tournament, Germany’s Raphael Kandra was put through his paces by 2013 World Junior CHampion Karim El Hammamy before coming through a 97-minute encounter to win in five games, setting up a repeat of his British Open semi-final clash with Colombia’s Miguel Angel Rodriguez in the next round. 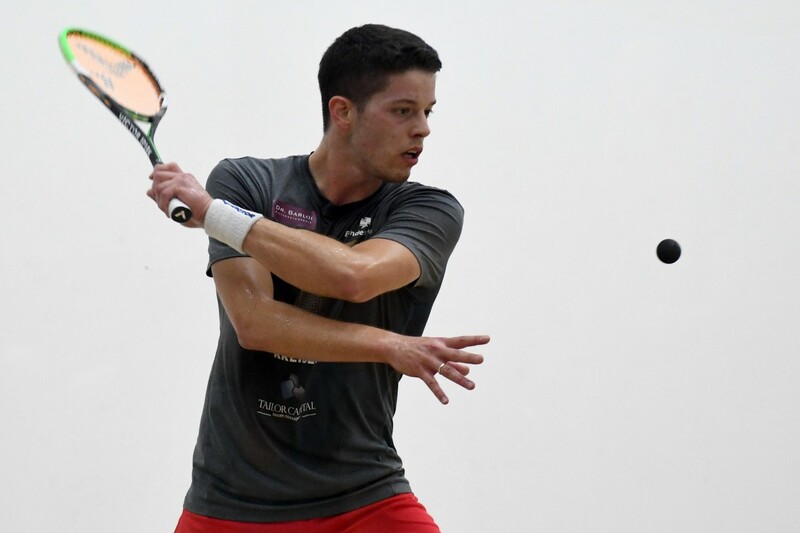 Kandra’s last tournament on the PSA Tour saw him stun the squash world to reach the last four of the prestigious British Open but he was put through his paces by a dogged showing from El Hammamy, with the World No.22 eventually coming through to win 11-5, 9-11, 11-13, 11-7, 11-6. Qatar’s World No.28 Abdulla Mohd Al Tamimi is also through to the last 16 after he cruised past India’s Harinder Pal Singh Sandhu, making it two wins over the World No.60 in as many weeks after he also got the better of him at the Asian Games. “I just played him in the team events at the Asian games and had played him a few times before, so I just had to keep the pressure on him at the back of the court,” said Al Tamimi, who will play Switzerland’s Nicolas Mueller in the next round. “It’s not the way I love to play but it was the way to beat him, I had to get the ball deep in the corners and when he took me short I tried to attack him from the front." The China Open is the first PSA World Tour Gold tournament to be played under the new PSA Tour structure - which came into effect on August 1 - meaning that the top eight seeds in both the men’s and women’s events receive a bye into round two. 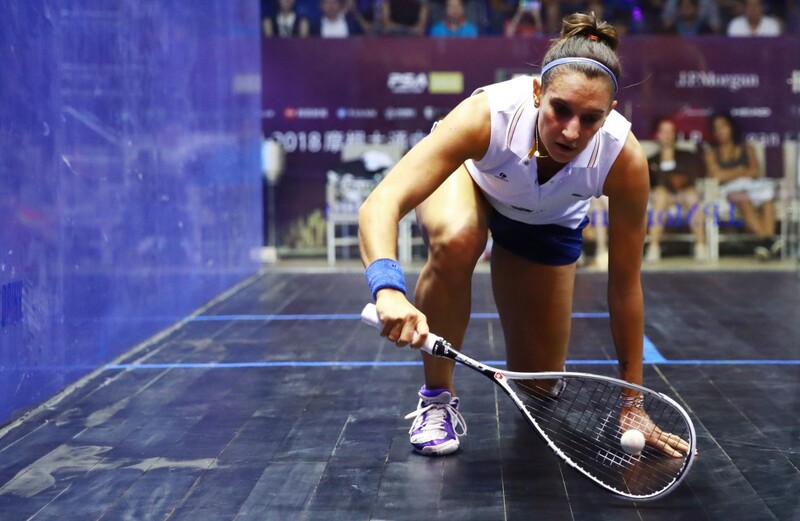 The likes of women’s World No.1 Nour El Sherbini and men’s World No.5 Simon Rösner will start their tournaments tomorrow at the Peninsula Shanghai, while matches will also be played at SECA Academy. 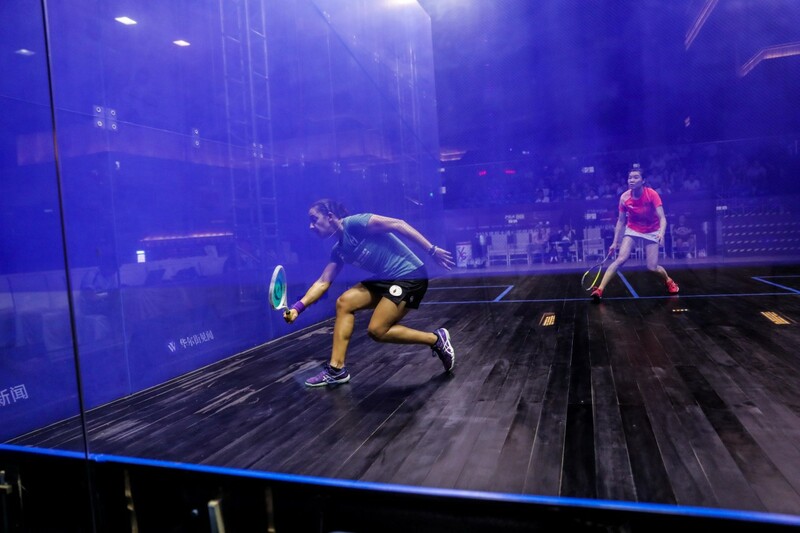 Tickets for the 2018 J.P. Morgan China Open have now gone on sale with squash fans given the opportunity to watch a number of the sport’s most recognisable players battle it out for honours at The Peninsula Shanghai between September 5-9. Germany’s World No.5 Simon Rösner tops the men’s draw alongside the likes of British Open champion Miguel Angel Rodriguez and 2015 champion Gregory Gaultier, while the top 10 women in the world will also be in attendance, including World No.1 and defending champion Nour El Sherbini, World Champion Raneem El Welily and 2016 champion Laura Massaro. “J.P. Morgan is pleased to become the title sponsor of the exceptional event in China again this year," said J.P. Morgan China Chief Executive Mark Leung. "As China continues to open up its markets, we are bringing the full force of J.P. Morgan Chase to China to support our clients, further develop the local markets and contribute to the local community. Supporting major sports events is one of our many ways of giving back to the local communities that are so critical to both J.P. Morgan and many of our clients globally." Both the men’s and women’s draws will be contested by 24 players, while a record prize purse of $241,000 – over a 20% increase on the 2017 edition’s prize money – will be split equally between the male and female players. First round, second round and quarter-final matches will be split between the SECA Academy Jinqiao Center and The Peninsula Shanghai, while all semi-final and final matches will be held at The Peninsula Shanghai.